The Minthorn house is at the far left. Photo courtesy of The Oregonian. 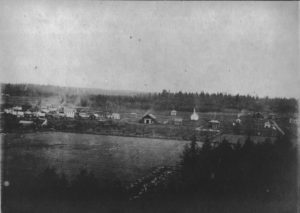 In the 1880s, when the Minthorn family lived in Newberg, the yard around the house reflected the necessities of a family in a young settlement: an orchard with young fruit trees. 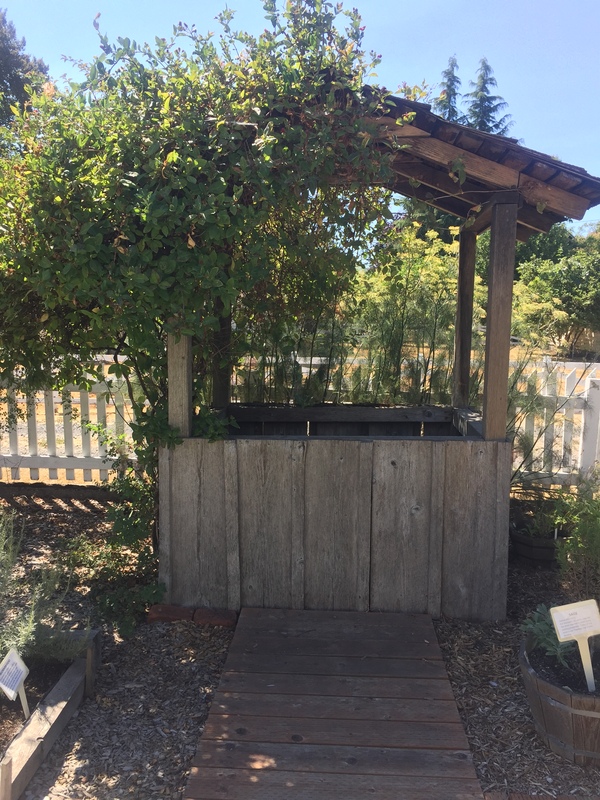 Apple, damson plum, and the pear tree that Hoover remembered so vividly, were planted in the yard to provide the family with fresh fruit during the summer. The fruit would preserve well for winter eating. Vegetable patches provided fresh produce and herbs, some that were dried for later use. In sunny weather, clotheslines held the family’s wash to dry. 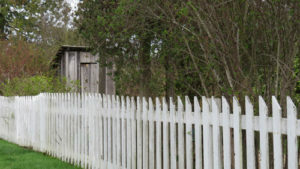 Other structures included a stable, a well and an outhouse. The only early evidence of the yard is in a photograph (black and white, above) taken in 1887 that shows the house on flat cleared land above the bank of Hess Creek. The mature fruit trees and the lovely green lawn surrounded by a white picket fence you see today were not here when Bertie Hoover came to live with his Aunt Laura and Uncle John Minthorn in 1885. To prepare for the 1955 dedication of the Hoover-Minthorn House Museum, Elizabeth Lord, of Lord & Schryver landscape architects, created the design for the yard and garden. She based her plan on the styles of 1900 to 1910 which were greatly influenced by Britain’s Victorian Era landscape designs. Hedging blocked views of newer buildings and boxwood defined the front entrance. Lord selected rugosa roses, with their protective prickles, to line the picket fence on the street sides. Native shrubs like flowering red currant give the back of the garden a suggestion of wilderness. The fruit orchard is reminiscent of many homes in 1880s rural Newberg. 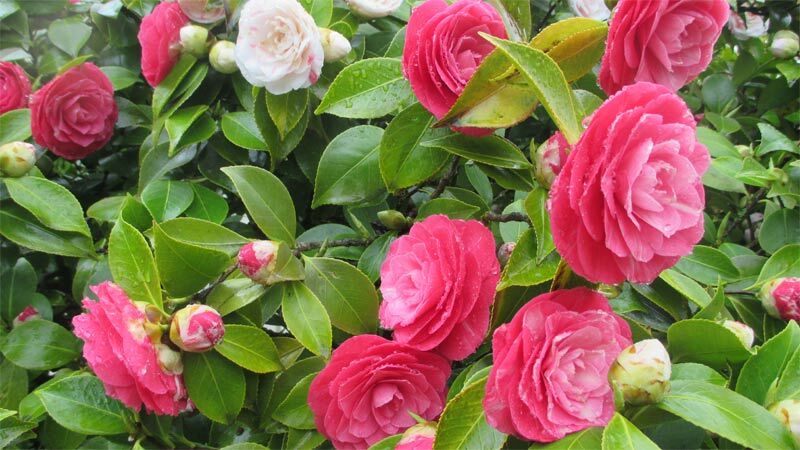 While some of Elizabeth Lord’s plantings have been lost to age and windstorms, many of these plants still thrive, providing a sense of serenity as befits the graceful style of the home. 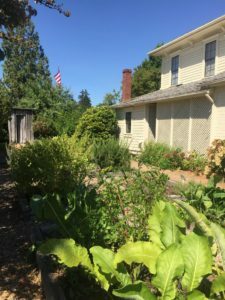 Researched and written by Diann Conser, Chehalem Garden Club.